Art Deco figures rarely fail to make an impact, and the examples in this month’s Works of Art, Medals, Militaria and Furniture auction at McTear’s are no exception, with four fine Art Deco female figures due to go under the hammer on Friday 23 November. Certainly a standout piece, lot 903 features the figure of ‘Lieselotte’, an impressive Art Deco figure by celebrated German sculptor Johann Philipp Ferdinand Preiss (1882–1943). Preiss was one of the foremost sculptors of the Art Deco period and is well known for outstanding figures and sculptures. As illustrated by this beautiful piece, ivory carvings were one particular strength of the artist, a fact that is perhaps unsurprising given his upbringing. Orphaned in his teenage years, the adolescent Preiss joined the family of accomplished ivory carver Phillip Willman, and worked closely with Willman for several years. Preiss then embarked on travels across Europe to advance his trade, later meeting Arthur Kassler and ultimately co-founding Preiss & Kassler, an ivory-carving business based in Berlin. Decades after his death, the Preiss name remains synonymous with the splendour of Art Deco, and has a huge appeal for collectors. In fact, as a consequence of the incredible quality and craftsmanship of Preiss’ sculptures, some of his most attractive works have achieved five-figure sums at auction in the past! The figure of Lieselotte is especially typical of the artist, exhibiting the striking coupling of ivory with gilded bronze for which he is so admired. 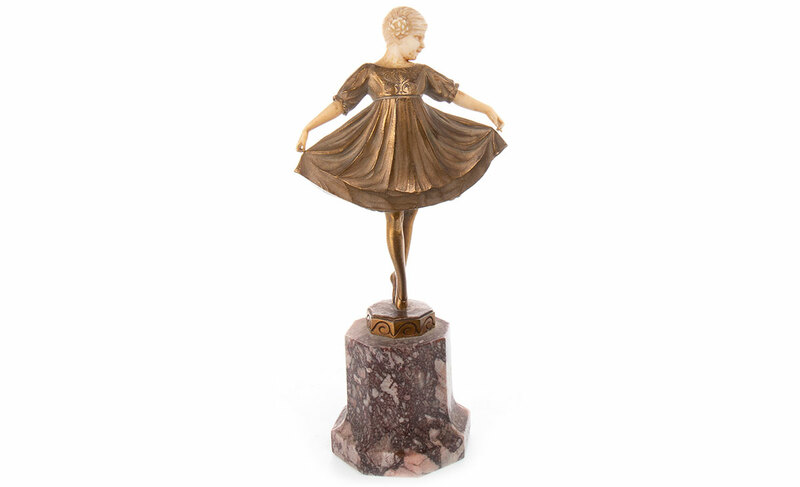 This petite female figure is modelled curtseying on tiptoes, and with sophisticated detailing to her ivory face, hair and her bronze dress. With an attractive auction estimate of £700- 1000, this is one lot that is sure to attract interest when it goes under the hammer. Of course, the female portrayed in dance is a prominent pose of the Art Deco figure, and two further examples – each with arms outstretched, leg elevated, toes pointed and emanating energy – are due to go under the hammer on Friday (lot 935 and 961). These attractive figures come with auction estimates of £100–200 and £70–100 respectively. Another Art Deco-style figure group features at lot 988, an imposing figure group of a female and two dogs. This charming piece comes with an auction estimate of £60- 100.